Hey lovelies! I'm back with another sales haul post. I've been looking forward to the New Year's/end of season sales since the Autumn/Winter 2016 collections came out, haha. I fell so hard for all of them! I especially loved Ank Rouge's collection "Innocent Black." Universal-Doll has a great post about the recent transformation in Ank Rouge's style from sweet seiso to LARME style. As you may I have guessed, I am a huge fan of the brand's newer looks. I didn't realize that nearly everything I bought was pink or black until I took the photos. I'm a little embarrassed about the lack of variety, but I was instantly drawn to these pieces in these colorways so I don't regret it. The pink/black combination was particularly popular in AW 2016 Japanese street fashion. Without further ado, here are the pieces! I will link the pieces, but some may be out of stock. I bought these pieces through FASHIONWALKER. I paid with an overseas credit card and used Tenso to forward the packages. 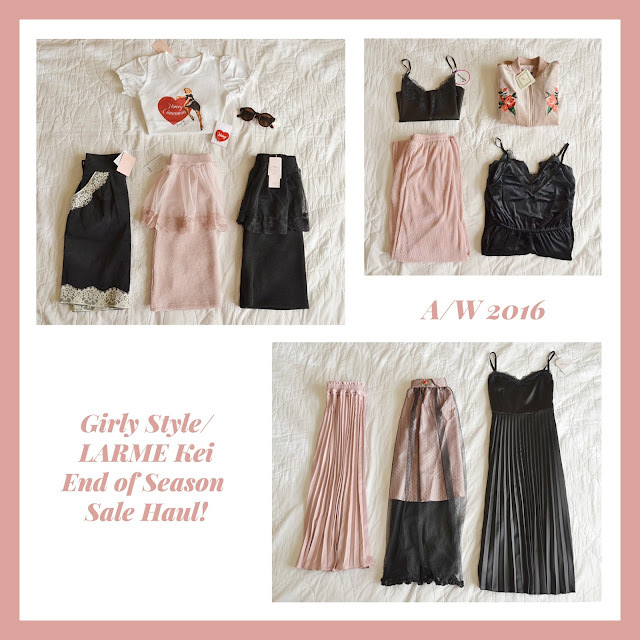 (See our LARME kei shopping guide for more information shopping in general and about using Tenso!) Note that some pieces may be sold out on FASHIONWALKER but not Ailand and vice versa. This is my favorite piece of my whole haul! I've been very into maxi skirts and wide legged pants/culottes this winter because they allow me to wear my Uniqlo Heattech leggings underneath. The feeling/quality and look of this skirt are amazing! Dusty pink (and often pleated) maxi bottoms are very trendy these days. I fell in love with this piece as soon as I first saw it on Ank Rouge's website during the fall. The skirt is a little OTT, but it looks amazing when coordinated with a simple black top. The material is a little scratchy and not as nice as the accordion pleat skirt, though. I actually bought this because it is very similar to a much more expensive E hyphen world gallery BonBon dress! I love the E hyphen BonBon one, but I love the Ank Rouge dress as well. The material is the same as the accordion pleat skirt--smooth and substantial. I bought these pieces on Honey Cinnamon's web shop with my foreign credit card with PAY ID and used Tenso. Note that the Honey Cinnamon web shop does not directly take foreign credit cards! But PAY ID (which is similar to PayPal) does. You can choose to check out with PAY ID just like you would select to check out with PayPal. I ordered the pink one since it was the only color left in stock, but I received the white colorway instead! It was a pleasant surprise because I had actually wanted the white colorway more, haha. I needed a red, retro-style hair accessory to color balance with and this was perfect! So this isn't actually part of the Honey Cinnamon haul. I bought it on FASHIONWALKER along with the Ank Rouge pieces, but I forgot to include it in the Ank Rouge photos. My $5 sunglasses were not doing so hot, so I thought I would invest in a $13 pair. :P Retro round sunglasses (as well as retro heart-shaped) are my personal favorite. I've had my eyes on this skirt for a few months now and finally gave in. I actually like it much more than I thought I would! The velvet material is quite thick--perfect for winter. I had to resist the urge to buy these when they first came out. I absolute adore apron skirts and have been looking for a knitted/sweater style skirt for ages. These skirts are amazing! Honey Cinnamon skirts (in "one size" or size small) always fit me well. The Ank Rouge ones are always a little big. Here's an experimental coordinate with mostly Honey Cinnamon items! I bought these pieces on Spinns' web shop with my foreign credit card and used Tenso for package forwarding. The style of the camisole is adorable and I've been contemplating purchasing it for a while. But the camisole itself is very, very large. It seemed larger than the measurements indicated. It may just be the fit or the style, but I'm not a big fan of it. I think I will have to sell it. This jacket made this entire Spinns purchase worth it on the whole. The jacket actually came out shortly before the mass winter sales began, and I briefly considered buying it before the sales. But I was glad I waited! I was able to get the jacket 50% off. I had fallen in love with the pink color immediately! I haven't worn the jacket yet, but the quality seems good. Here are a few more pictures because the jacket is beautiful. And "impeccable," lol. These pants are a part of the pink, pleated maxi bottoms trend. I believe WEGO, Spinns, and other similar brands also carry other pants that are very much like these. These pants are on the long side (relative to other pants from Japanese brands). I plan to get them shortened. If you are short like me (155 cm) and want to get these pants, I would suggest that you prepare to have to do the same. I can't comment on the quality yet, since I have not worn them. So I have mixed feelings about the Spinns pieces, but I think the blouson tipped the purchase to the net positive side. I will need find a way to modify or sell the leather cami and I hope that I can get the pants shortened soon. Thank you so much for reading my sales haul post! ♡ Let me know if you have any questions about online shopping. Did you buy anything from the end of season/winter/New Year's sales in Japan? If so, what are your favorite pieces? I'd love to know! Oh I am so jealous! All the items are amazing!